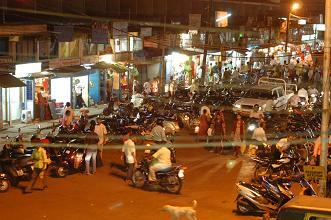 Mapusa (pronounced Mapsah) is the largest town in north Goa, and is a useful transport hub within the state. For travellers who are only familiar with Goa's laid back beaches, or the relatively quiet streets of Goa's capital, Panaji, Mapusa may come as something of a suprise. Teeming with rickshaws, buses and scooters the busy roads are lined with an obstacle course of pavements where chaat wallahs (snack sellers), shoe shiners and hawkers sell their wares under a beating sun. The huge Mapusa market is a sprawling mass of glittering fabrics, silver jewellery, tupperware, trinkets, bindis, saris, patterned blankets, insense, toys, fruit and flowers, suffused with the smell of spices and fresh coriander. Mapusa is typical of a great many Indian towns, and for Goa's foreign travellers a chance to experience what India is like outside of the tourist orientated coastal regions. With a little bit of getting used to, Mapusa is a lively and exciting town, and one I always look forwards to visiting. Mapusa Market Mapusa's open air market is fascinating to visit throughout the week, but is especially lively on the Mapusa Friday Market. Buy exotic fruit, spices and souvenirs from an array of items you never knew you needed! The market begins at around 8a.m. and an early morning visit will mean you avoid the heat of the midday sun. Shree Hanuman Temple The Hanuman temple (pictured by night, above) is a beautiful building and important landmark in Mapusa. Non-Hindus may not be permitted inside, though you can admire the interior through the doorway - bear in mind that visitors should dress modestly when around the temple (good practice for Mapusa town in general, really). Other India Bookstore Near the Mapusa Clinic (a left turn off the north-east end of Municipality Road), the bookstore stocks a wide range of informative books by Eastern scholars and authors. Books can also be purchased via their online store. Goa Carnival in Mapusa Held in February or early March the carnival in Mapusa is a colourful and greatly anticipated event, where floats and processions of musicians and dancers from all over Goa fill the town. 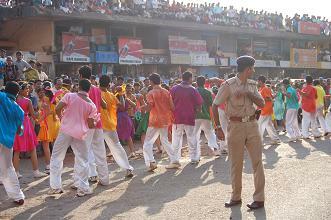 Visit our Goa festivals guide for more about festivities in the state. Eating and Drinking From street vendors food to Indian cafes and restaurants, there are a number of great options in Mapusa if you want to fill up on authentic food. Try out our favourites, listed below. Mapusa has a population of around 40,000, and is situated in the Bardez taluka (district) of north Goa. The dusty and somewhat dilapidated town sees temperatures range from around 21'C in winter, to 37'C in summer, and the sun can be very strong during the hotter part of the day. For centuries Mapusa has existed as a trading market town, and the name derives from the Konkani words 'volumes of measure' (maap) and 'to fill' (sa). The town was referred to in 1580 by a Dutch Chronicler who described it as Bazaar Grande. Two roundaboats lie to the north and to the south of the town centre, connected by a busy road. 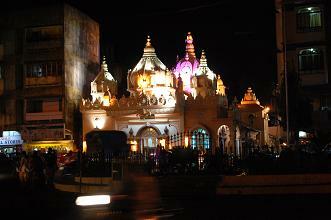 The distinctive pink Hanuman Temple lies on the northern roundabout and looks out upon the leafy Municipal Gardens. The roundabout to the south is near the main Kadamba Bus Stand, with the market lying a little to the east. There is a petrol pump and a tourist information centre in the lobby of the GTDC Mapusa Residency hotel. Mapusa lies on the NH 17 (National Highway 17) which runs along India's west coast connecting Mumbai with Trivandrum in south Kerala. The main Mapusa travel hub is its Kadamba Bus Stand, where frequent buses travel to numerous destinations on Goa's north coast, as well as heading south to Panaji and Margao. The busy and confusing bus station can be a challenge, but if you ask a bus driver / ticket collector (often found shouting out the destinations of stationary buses) you will usually find them very helpful. Buy your fare on board. For Thivim, the nearest train station to Mapusa travel 12 km north-east of town. Inexpensive to reach by rickshaw (find one at the car park by the petrol pump, or outside the northern entrance to the market), trains serve this station as they head down the coast towards Old Goa and Margao. In Mapusa travel by scooter or bike is challenging - do not underestimate the craziness of the traffic which will test even the most confident drivers. Parking can usually be found around the market area or the Municipal Gardens and is free if you can find a space. Unless you are riding a very distinguishable bike, make a note of your registration number to pick it out from the masses when you return. One of our favourite restaurants in Goa was recommended to us by a friend in Anjuna, and is almost impossible to find if you don't know of its existence! The Ruchira Restaurant & Bar is on about the 4th floor of the Satyaheera Hotel, next door to the Hanuman temple. A lift will take you straight up. Food is authentic Indian, and very reasonably priced. Nearby, just beside the Municipal Gardens (along the street that leads towards the market) Hotel Vrindavan is a canteen style cafe that serves excellent masala dosas and south Indian snacks, plus a wide slection of curries, and excellent chai. Finally, if you are in the mood for some quirky charm and something alcoholic, head to the simply named, 'The Pub' which looks out over the north entrance to the market, and busy street below. The slightly grimy and hugely atmospheric bar perches on the second floor, and is accessed by a narrow staircase beside a hardware store (you will see its sign from below). There is really little reason to stay in Mapusa, since rickshaws are plentiful and the beaches are nearby. Should you wish to stay the night (or if you are continuing your travels onward very early) you could consider the Satyaheera (tel. 0832/226 2849) by the Hanuman temple or the Vilena (tel.0832/226 3115) by the Municipality building to the east of the town centre on Feira Baixa Road. From Mapusa travel directly west to reach the popular destination of Anjuna beach. Travel north from town and the bear west to reach the leafy, inland village of Siolim. Discover more inland Goa attractions! A quintessential tropical paradise, Palolem beach beckons from Goa's south offering an alternative to the busy resorts of Calangute and Baga. Know any great places to stay in Goa? Please share with our readers! View Vagator beach from Chapora Fort in Goa's north before climbing down towards an invitingly warm sea and cold Kingfisher. Escape to the coast of Kerala, the warm sea and baking sands of south India.